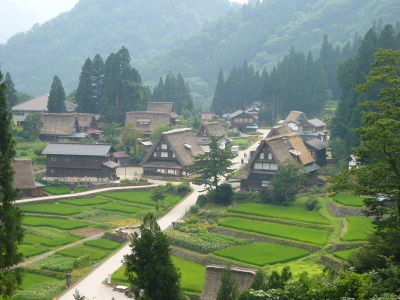 The Historic Villages of Shirakawa-go and Gokayama are traditional Japanese settlements. The houses in the villages in the valley are unique to Japan. They are very big, and have thick thatched roofs that come down steeply. This way the snow can slide off the roofs. There is also enough space under the roofs to store supplies for long winters. The inhabitants of these villages used to earn their money in the silk-industry. They lived a very secluded life. In Japanese, the houses are called Gassho-zukuri. Gassho means praying hands, suggesting the form of hands raised in prayer to the buddha. Here it refers to the triangular shape of the roof. Within the valley, I visited the village of Ogimachi, a two hour bus ride from Takayama in the middle of the Japanese Alps. There quite a lot of the Gassho-zukuri houses can still be found together. Although it was packed with Japanese tourists, I liked it a lot. The environment is totally unlike the stereotype Japan. In a way, the scene remembered me of Bhutan, where in the green valleys also these kind of big houses annex farms still stand (however without the characteristic thatched roofs). I loved Shirakawa-go and had a good length of time to explore it. Many people come in just for the day and walk around and go to the shops. I was lucky enough to do a home stay and spent the night in one the houses with a family. It was fantastic to not only see one of the houses from the inside, but also experience what it would be like to live in one. I was here during winter and the snow and the roofs is so beautiful. I imagine the town has a really different look for each season - you could go four times in a year and see such different views. Deep in the scenic valley of Japan Alps, but easily accessible by highway, was the beautiful village of Shirakawa-Go, a wonderland of beautiful landscape with traditional farmhouses built in the style called Gassho-Zukuri, a steeply thatch roof house to prevent snow accumulation. The houses were really unique and different with mainstream Japanese architecture which can not be found in other region of this country. 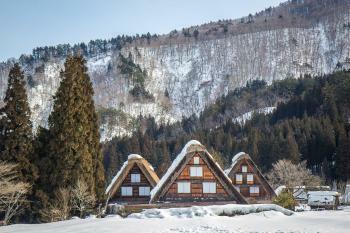 Since the farmhouses were designed for winter, I decided to see the village in the best time of the year, February when the snow was heaviest, and my decision was correct, the whole village was liked a fantasyland with the unique Gassho-Zukuri roofs emerged from the white sea of snow. The houses were really big and beautiful, and the snow made them looked more unbelievable to be existed. The village was well prepared for tourism, locals made many cute snowmen for photo spot while in the souvenir shops were packed with hundred of gifts made in the shape of Gassho-Zukuri. After the village I went to the famous viewpoint to see the postcard view of the village, and the view was just amazing and should be seen by everyone. Then I continued my trip to Shirakawa-Go-no-Yu, the traditional hot spring bath hall, to sample the experience, the hot spring and the river view from outdoor bath were really good. I really enjoyed my trip to Shirakawa-Go; the village in winter was exceeding my expectation, and was one of the highlight of Japan apart from Kyoto which was always my highlight of every Japan trips. Actually judging from other reviews, the place seems to be great for every season and from my opinion, another great WHS that deserved to be listed and seen. 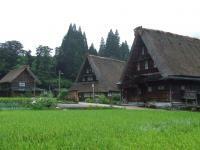 I too visited Ogimachi village in Shirakawa-go by taking the bus from Takayama. While Ogimachi was quite large and had many gassho houses, some of which I went inside to inspect, it was also very crowded and touristy. From Ogimachi there are other buses that travel to Takaoka, and on the way stop at the other two villages, Ainokura and Suganuma in Gokayama, that form part of this WHS. They are equally authentic, but are much smaller and attract far fewer visitors than Ogimachi. The first impression that I had with Shirakawa-gou was from a picture I saw on the internet. It feeled just too beautiful to be real. Then I did a lot of research online about this picturesque place; and actually went visiting in November 2005. Its purity and tranquility can really ease a person's mind. You can also enjoy different scenery when visiting in different seasons. I will go visit again and again if I had time; and really soak in the true beauty of Shiragawa-gou. If I can only select one farming village to go in Japan, I must select Shokawa-village. I went there in 1999 but taking 2.5 hours bus from Takayama. I arrived there at night and stayed in a homestead. I could see nothing inside the village at night. In the next morning, when I opened the Japanese window-door from my room. I see many Gassho-zukuri houses just outside! The houses lies inside the valley of the Japan Alps. It likes a picture more than a village. It might be more convenience to visit the villages as a highway was opened from Nagoya to Toyama. Shinto: The guardian deity of the Shirakawago's Ogimachi village is housed in the Hachiman Shinto shrine, and Ainokura is at Jinoshi Shrine.